Part of what makes a sidecar motorcycle tour so unique is the vintage sidecar motorcycle itself. I have travelled for over 5 years around the world and worked as a tour guide in 2010 in Beijing for Beijing Sideways. This is where I fell in love with these type of motorcycles and I decided to set it up myself in my home country. I started the this company in 2012, when I realised that it was very hard to find a good suitable vintage motorcycle. The only option was to buy a motorcycle and completely restore it myself. So for a year I have learned how to restore these motorcycles and so far have completed two and I am currently working on the third. The original design of the motorcycle is the BMW R71. These motorcycles were created as a result due to the Treaty of Versailles after the first world war. These motorcycles turned out to be such a success in combat in the second world war, that the Russians copied the motorcycles in the early forties. 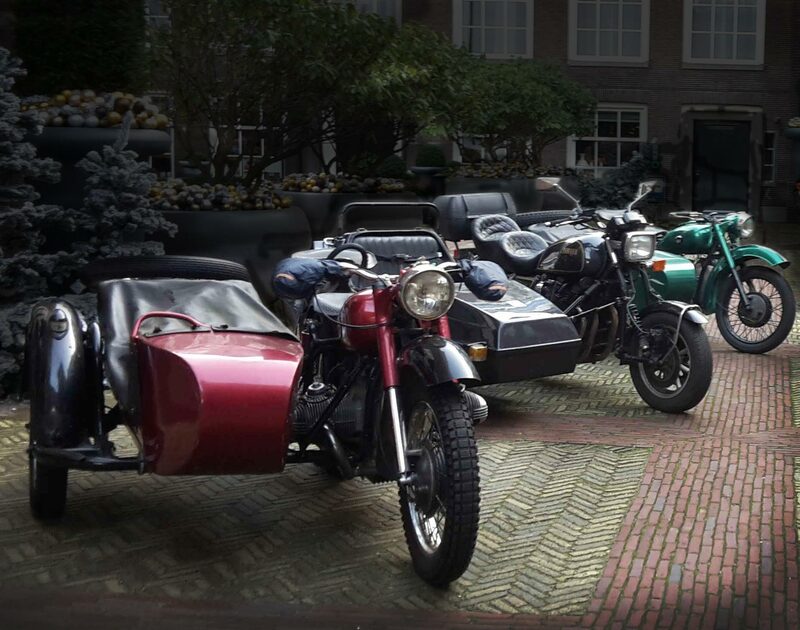 These motorcycles were produced in Soviet Union in different countries, including Russia, Belarus and Ukraine. The most famous brand from the Soviet Union is the Ural. Its little brother from Ukraine is less well known: DNEPR. The Ural and DNEPR bikes are virtually the same and only an experienced eye can tell the difference. The motorcycles we drive on are of the brand DNEPR. As mentioned above, the motorcycles are completely restored and very reliable now. The original engine is swapped for a boxer engine of a BMW R80/7 motorcycle from 1979. The brakes have been upgraded to modern standards and every part imaginable has been replaced, fixed and refitted. So you don`t have to worry about the safety when being driven around in one of these old vintage bikes. These motorcycles have been produced under various names and in different countries in the Soviet Union. The longest running factory was the Ural factory, running from 1941 till now, only to be on the brink of bankruptcy when it was reorganised in 2000. In 1957 the design of Ural was sold to China where they the motorcycles have been produced under the name Chiang Jiang. In China they have produced the classic sidecar from 1957 till 2003 and they have produced over a million units. So luckily there are still plenty of these motorcycles around!